Catch up on Season 1 of Sonic as Season 2 picks up speed in the main series! 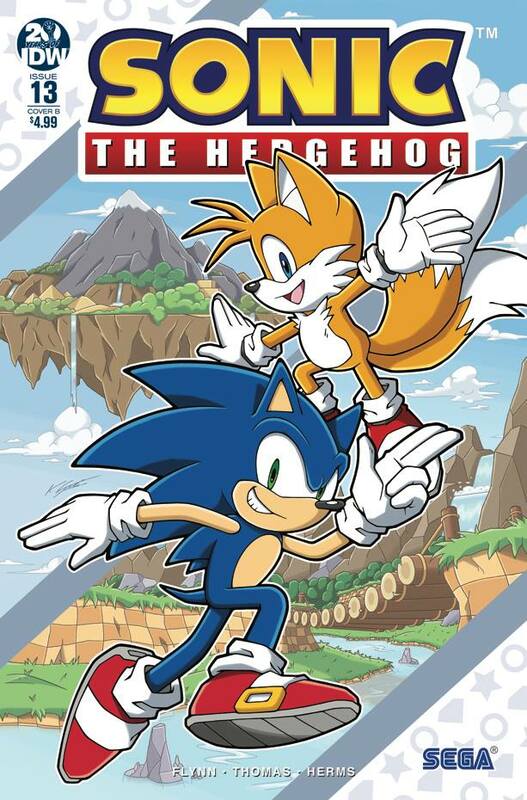 Includes a special sneak peek of the upcoming Sonic the Hedgehog: Tangle & Whisper mini-series, coming this summer! 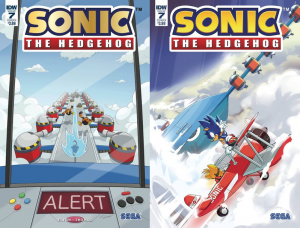 Sonic The Hedgehog Annual 2019 will feature three covers, including one from Sonic franchise icon Yuji Uekawa, best known as the visionary behind the “modern” look of Sonic. 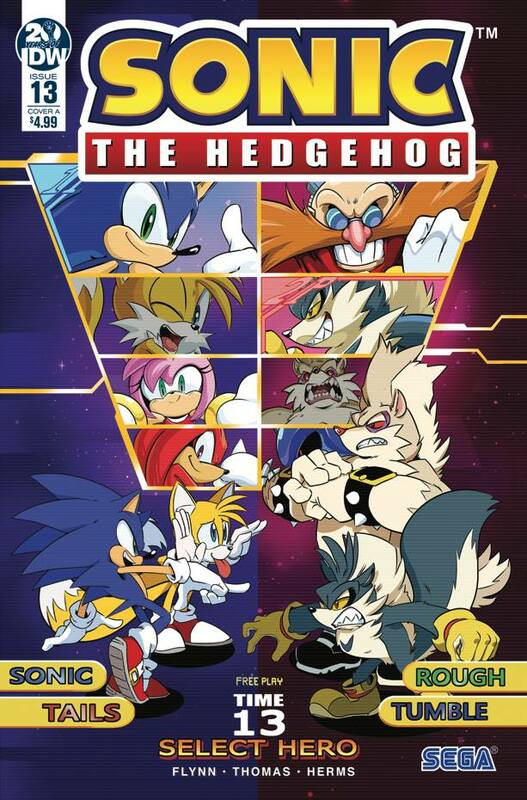 “I am really happy to draw IDW’s original characters altogether with Sonic and his friends, as I had never imagined that I would draw these characters as official artwork,” Uekawa said in a release. 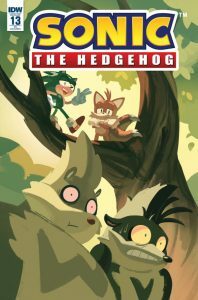 “As with many IDW Sonic series fans, I personally love Tangle and Whisper, and I am very much looking forward to seeing their further adventures with Sonic, as well as seeing original characters in future issues!”Uekawa has been with Sonic Team since the late 1990s, serving as the lead behind the game’s character designs since 1998’s Sonic Adventure. 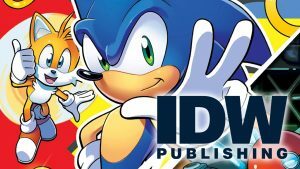 IDW announced last year, in conjunction with the official Sonic Twitter page, that they would be launching a new series in the wake of Archie Comics’ cancellation of a series with the same name. 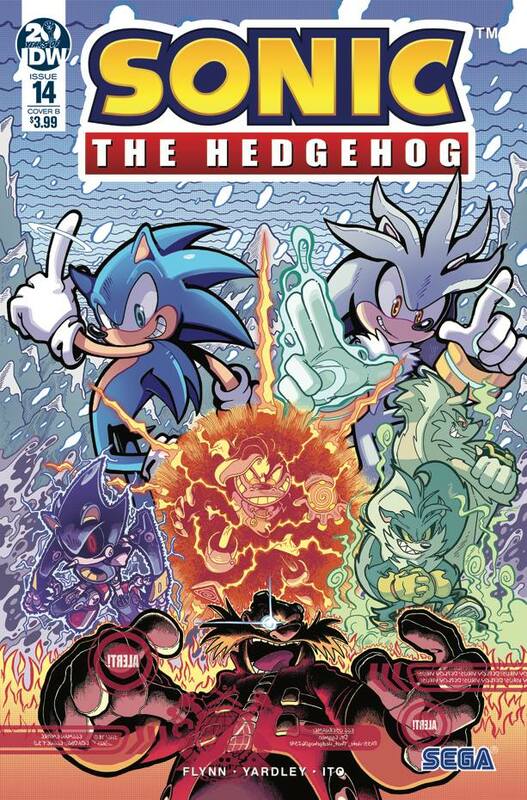 Fast forward to this year and IDW launched their Sonic ongoing series in April from Ian Flynn and a rotating cast of artists. Time for a break! Sonic can finally take some time to catch his breath, secure in the fact that the day’s been saved and his old greatest foe is… Wait. He’s gone?! What does that…? 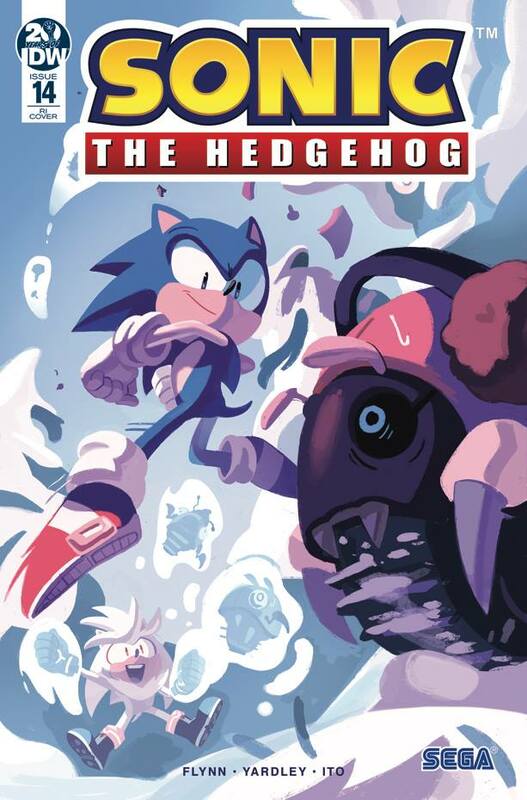 Well, that smells like trouble…The return of Rough and Tumble!Sonic faces a new threat that kicks off year two with a bang!Extra-length issue! 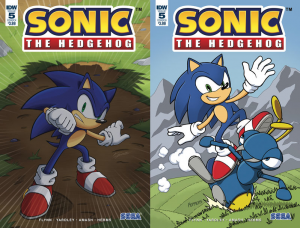 From 3-4PM on June 29th editors John Hughes and David Mariotte of IDW Sonic answered fan questions over facebook about questions of the future of the comics and future appearances of past characters. Below are all questions that were responded to. How would it be possible for me to get to draw a cover for the comic? Realistically, Joe and I are mostly looking at comics professionals, though, clearly we also find people like Nathalie Fourdraine online and are taken by her art in such a way that we reach and hired her. Really, it’s just a matter of showing professionalism and having a good portfolio that’ll be approved by IDW and Sega. I wanna know if Sticks the Badger will ever appear in the series. I know she’s from Boom, but, I’ve seen her appear alongside regular Sonic in some games, so, it’s still a possibility. Also, I second that drawing of covers idea. Hey Matthew! We’re working on bringing in more characters that fans love, but I can’t go into specifics yet (I know that’s a vague answer. Sorry!) But I think you’ll be happy with some of the characters we have appearing in the comics in the coming months! I would like to add to that question. Is Sonic allowed to experience defeat or cry in an issue or is he always the winner in every instance? Thank you. We’ve talked about this a bit before. Anytime you’re editing licensed comics, there are things you can and can’t do. For example, Sonic isn’t going to be red with a big bushy beard and sweatpants in any upcoming issues because, well, that’s not how Sonic looks! We definitely have some mandates of that nature that we have to work under, but most of it’s common sense stuff. 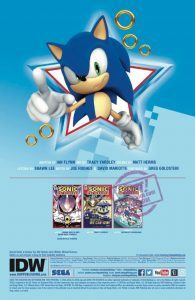 Sega’s been a great partner to work with and has largely let us do what we want to with the comics. What are some of the hardest things about editing the comics, especially for a fanbase as diverse as Sonic fans? Would love to see some more insight into your guys’s world!! One of the things David and I talk about a lot is the idea that editing the Sonic comics is a lot like editing the X-Men — there’s so much history and so many great characters. The biggest challenge early on is finding the balance between making comics that will make longtime fans happy, while also making comics that are accessible for new readers! It can be tricky, but if the hardest part of my day is making a fun Sonic comic for folks, then really, my day has been pretty good. What species is the new character, Whisper? You’ll have to wait a little longer to find that out! But you’ll know soon! You’ll see really, really soon! In just a few weeks, I’d say. 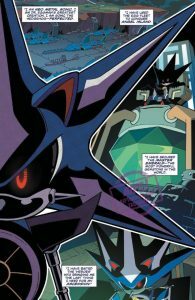 Will Infinite appear in the comics? He’s one of my favorite charaters! Thanks for your time! No thanks necessary! This is fun for us. We can’t answer that one yet, but I can say this: You’re going to see some folks you weren’t expecting, in places you didn’t expect to see them. Ian’s a fantastically talented writer and anyone who can get him would be lucky to have him—just as long as they don’t take him from us! What is Eggman’s motivation? Is he trying to take over the planet for giggles? Is he trying to protect it by making it mechanized? Or is he just plain evil? He is a villain with a lot of potential and I would love to see a What If? comic where he rules the world. Eggman? Who’s that? I only know a nice fellow named Mr. Tinker! This is a great question! One of the things that drew me to comics at a very young age was questioning the motivations of villains (I was obsessed with reading Dr. Doom comics as a kid for this very reason). And it’s the kind of thing that, down the line, I want to explore. Hello! Hope the day is going well for you guys! Are there any surprising moments you’ve experienced with any of the creative team that you could share? Joe, Ian, and I went to dinner during WonderCon 2018 and Ian laid out some loose plans for Sonic year 2—nothing final, just what he was thinking at the time. It started out with Joe and I responding affirmatively, but by the time Ian was finishing, we were just sitting in silence because we were so wrapped up in what he was saying. Also, there are always pleasant surprises like seeing how Tyson first designed Tangle, Rough, and Tumble, or seeing the first designs for Whisper! Ian Flynn once threw a pie in my face. No, but seriously, I can’t stress enough how cool, smart and fun everyone we’ve worked with so far has been. You know all the regulars, but I’d specifically like to give a big shout out to Nathalie Fourdraine, who draws the RI covers for us every month. This was her first ever professional comics work, and she took to the whole process so fast. It’s been a joy to see, and it’s incredibly rewarding. I’ve loved working with her just as much as I’ve loved working with veteran pros like Tracy Yardley, Evan Stanley, Ian Flynn, Tyson Hesse, Matt Herms, and a bunch of other people (I could go on all day)! Will we see more of team dark and is there a possibility for them to have their own comic? Also will shadow and rouge ever be in a relationship? I’m sure we’ll see more of Team Dark in the future. As per their own comic, I guess that’s a matter of a bunch of fans like you telling us that’s something you’d want to read. I mean… would YOU want to date Shadow? I love him to death, but that dude doesn’t seem like he’d be the most emotionally available significant other. Is there a rumor from Ian Flynn that when Sticks the Badger joins IDW Sonic the Hedgehog comic books in a future issue that she might get an IDW makeover that’s different than her Sonic Boom “jungle badger” look? I had not heard that rumor, but it may exist. 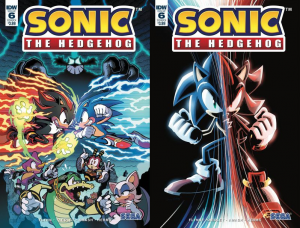 How many books do we need to buy to get a second book like Archie’s Sonic Universe? I know we don’t want to rush things, but is this a future possibility? We can’t really put a specific number on that. That said, making sure that you’re not only subscribing or picking up every issue, but telling your friends about the series and getting them to pick it up is a huge help for seeing more content in the future. Constant or even rising numbers will signal that we need to put out even more stuff. Now that Mighty and Ray are back in the fold, will we see them soon? Can Mighty be part of the Chaotix or not? Mighty and Ray are classic characters (why they’re appearing in the amazing Sonic Mania Adventures series), so unfortunately, we won’t be seeing them in the main series which is based on Modern Sonic. 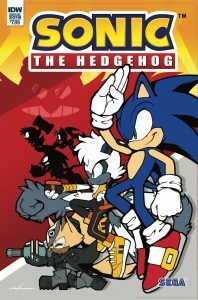 Will IDW ever do miniseries of Sonic X, Sonic Boom, Sonic Underground, and Sonic SatAM? If fan demand is high enough and there are great stories to tell (which there are), I wouldn’t rule them out. But no plans in the foreseeable future. 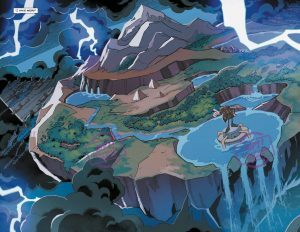 Is the comic book going to stick to it’s own ideas and be written with fans of the video games in mind, or is there a possibility for more detailed flashbacks from the game events for uninitiated readers? One of the really difficult things with this series is striking the right balance between moving forward and having context, right? We’re certainly inspired by the games, but if we were to go back and rehash exactly how our version differs from them, that’d be kind of boring to those who do know and would detract from moving forward into new adventures. So, for now, I think it’ll mostly be small flashbacks. Any thoughts on bringing the off-panel mini joke comics at the end of the book back? If you ever need an artist for it I specialize drawing in a “toon” comedic style! Having read some of those, they’re a lot of fun. We don’t have any plans for anything like that right now, but we’re certainly going to keep up the Sonic Letters Squad in the backs of the books. We really love all the IDW comics so far. I personally have an extra special love for issue #4 because it was the first appearance of Tangle and specifically the people in this group just had such an outpouring of love for her and for that issue. I don’t really want to play favorites, but that’s a very special experience that does set that issue apart for me. To echo what David said, the fan reaction to Tangle was one of the most amazing and humbling experiences I’ve had working in comics. So in that sense, that issue is pretty special to all of us. I also don’t want to choose a favorite, but I’ll say this: I am reeeeally excited for all of you to see issue #7. Will Tangle the Lemur appear more regularly in the future? Tangle will definitely be coming back! We’ll be seeing her more soon! 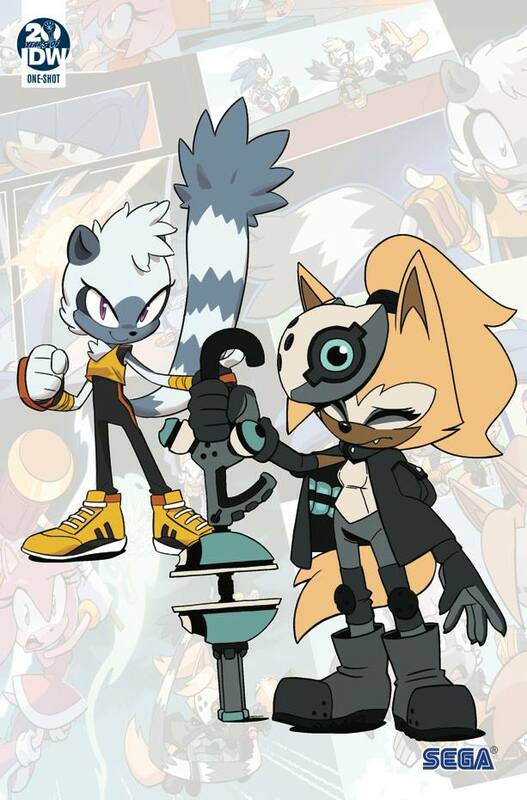 Tangle will be showing up again in issue #9, and she’ll be around for a while, if I have anything to say about it. Thanks for the question. Will we get Classic Sonic mentions? If we ever do anything with Classic Sonic, it’ll like be it’s own series. The current sereis is all focused on Modern Sonic. 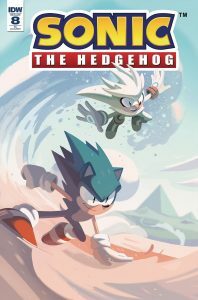 Is the IDW team interested in bringing the Sonic the Hedgehog comic book across the globe? We definitely are! I know we have it available around the world digitally, but we very much want to get it into as many hands as want to read it! When will Big the Cat be in the comics?? Not soon enough for you or me. You might not know it yet, but you and David Mariotte just became best friends. How are you finding people’s responses to how the comics have started off? Did you feel like Archie was a lot to live up to? People have a lot of feelings attached to the versions of Sonic they grew up to and that’ll always color their impressions. I’m very glad you’re enjoying the series (we are too) and the response has largely been good! New readers are happy and so are old ones! I think some people have a hard time really understanding that what we’re doing is new, so they can be hard to sway, but mostly the response has been positive. Glad you’re enjoying it! The response has been overwhelming, inspiring, and at times genuinely touching. I’ve never come across a fanbase quite like this one. You folks are pretty great. 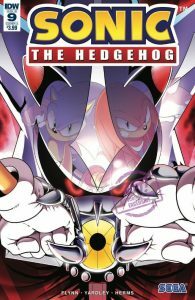 Will you ever consider to have crossovers with other IDW series or is it strictly sonic for now? Strictly Sonic for now! I’m sure we’ll consider it, but not anytime soon. Is there any way to purchase the bundle with the T-shirt outside of the US? If no, can that be made possible, please? Unfortunately, that bundle was run through the Sega Shop, so that wasn’t our decision. Keep asking Sega to do more stuff like that and hopefully they’ll be able to release it more widely! What are fans to consider Canon prior to issue # 1? Obviously the characters have already met in the IDW comics, so what do we assume their back stories are? As we go along, I think that’ll answer more and more about what is canon. At this point, the only really formalized canon is what we’ve had in the comics. For people who don’t know Sonic, it’s important that they don’t have to know anything to enjoy the comics as they are. Will the chaos emeralds make an appearance at some point? At some point, probably! They’re too big a part of the Sonic mythos to never be seen. The team has done a great job at introducing all the major characters in Sonic’s world (Tails, Amy, Knuckles, Shadow etc.) one issue at a time, and establishing their relationships with Sonic. What kind of direction do you see the series taking after all this groundwork has been laid? What would you like to do with year two that wasn’t feasible in year one? We have some ideas in mind and Ian has some ideas in mind for year 2. Things are picking up in year one and will expand as we go forward. 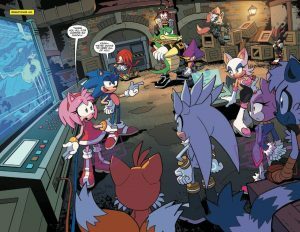 I think one of the things that was very important to us with the first few issues was situating people in Sonic’s world. Tangle is, to us, what a person who just found themselves meeting Sonic one day would be like and we want to have people understand Sonic before getting into some of the crazier stuff we have planned. 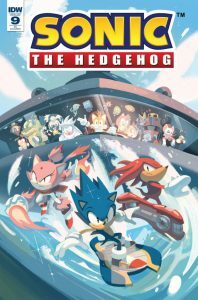 I know he’s busy, but will Tyson Hesse have any more involvement with the comics this year or next? Tyson is CRAZY busy, but he’s welcome to work on the comics anytime he likes. He has an open invitation. Who are your favorite all time Sonic characters in games and comics? It may be a lazy answer, but for me it’s Tails. He’s a young, brave kid with a really strong sense of right and wrong. He doesn’t do what he does because he’s addicted to adventure, and he isn’t motivated by tragedy. He just wants to help people. I admire that. ‘The Fate of Dr. Eggman,’ Part 1. 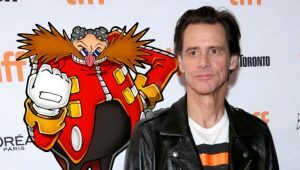 After his last battle with Sonic, Dr. Eggman’s gone quiet. His Badnik forces are still causing trouble, but without the bad doctor’s usual fanfare. What’s Eggman been doing all this time? And what will happen to Sonic when he finds out? Guest starring: The Chaotix Detective Agency! ‘The Fate of Dr. Eggman,’ Part 2. Dr. Eggman has been located, but Sonic’s not the only one to find him! When Shadow comes, whose side will Sonic be on?!? Secrets revealed! 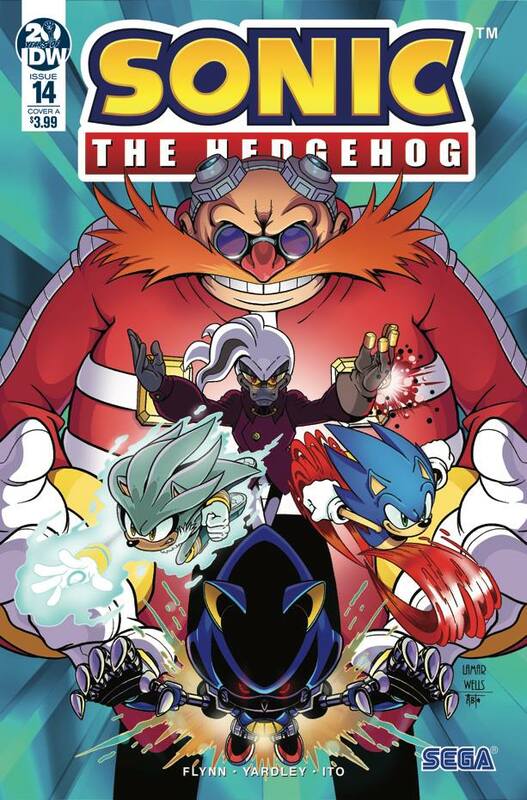 After the dramatic events of the last two issues and the secret of Dr. Eggman, Sonic races off to shut down the organized Badniks at the source. Unfortunately, there’s more at play than Sonic has realized, and more powerful players… One of the first major villains of the new series revealed! A special foil cover to celebrate entering the second half of Sonic’s first year at IDW! Don’t miss the new Sonic the Hedgehog: Crash Course Board game in our games section! *Retailers: See your order form for incentive information.